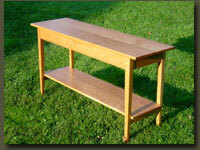 Handcrafted solid wood furniture from Clarner Woodworks is a perfect choice for the home or office. Our furniture is custom built to your specificatons -- as you browse this furniture gallery, keep in mind that you can use one of these furniture designs as a starting point to design your own custom wood furniture piece, dream up something completely new and unique, or choose one of these designs exactly for your new home or office furniture. 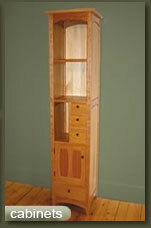 Doug Clarner, furniture maker at Clarner Woodworks, has a unique design style. Rooted in the Shaker tradition, his furniture style also calls upon elements from the Arts and Crafts movement and shows some Japanese influences as well. He has also produced custom made Mission style furniture for clients. Our furniture gallery displays many unique furniture ideas for the perfect custom built sideboard, bed, hall table, coffee table, cabinet, dining table, bench, and end table. We also feature some unique wedding gift ideas and furniture appropriate for personalized corporate gifts. Our handmade solid wood furniture will make a welcome addition to your home living room, bedroom, dining room, kitchen or office. 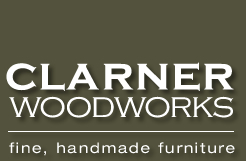 Furniture constructed by Clarner Woodworks is handmade with the highest level of craftsmanship. Only the finest woods are chosen, resulting in a piece that is durable and solid. Wood furniture has a timeless appeal, and a custom built furniture piece from Clarner Woodworks will be cherished for generations.